We need one of these! 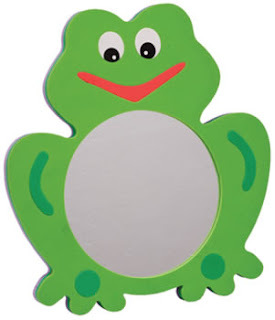 This is a frog mirror. They have one at Appletree Children's Centre just down the hill from home. Me and Jack have been there twice today - once for Stay n Play and then back for Marsh Mums. And both times this has been the one thing that Jack has loved the most (other than being cuddled by other mums because he was the youngest there this afternoon and was getting people broody). It's foamy and soft. The one at Appletree is covered in bite marks too where other kids have loved it. You can bend it to distort the reflection too. Jack had a good hold of it and 'chatted to the other baby in the mirror' for AGES! And while I found a picture of it on the web easily enough, I can't find anywhere locally that sells one.